'I really enjoyed Glenda's novel. It's well researched and well written and I found myself caring about her characters' Rosie Goodwin 'All the ingredients for a perfect saga and I loved Meg; she's such a strong and believable character. A fantastic debut' Emma Hornby Belle of the Back Streets is a dramatically powerful and romantic saga of tragedy and triumph, perfect for fans of Dilly Court. 'Any rag and bone!' Everyone recognises the cry of Meg Sutcliffe as she plies her trade along the back streets of Ryhope. She learnt the ropes from her dad when he returned from the War. But when tragedy struck, Meg had no choice but to continue alone, with only her trusty dog Spot and beloved horse Stella for company. Now the meagre money she earns is the only thing that stands between her family's safety and predatory rent collector Hawk Jackson... Many say it's no job for a woman - especially a beauty like Meg who's noticed everywhere she goes. When she catches the eye of charming Clarky it looks like she might have found a protector and a chance of happiness. But is Clarky really what he seems? And could Adam, Meg's loyal childhood friend, be the one who really deserves her heart? 'Glenda has an exceptionally keen eye for domestic detail which brings this local community to vivid, colourful life and Meg is a likeable, loving heroine for whom the reader roots from start to finish' Jenny Holmes 'I found it difficult to believe that this was a debut novel, as brilliant was the word in my mind when I reached the end. I enjoyed it enormously, being totally absorbed from the first page. I found it extremely well written, and having always loved sagas, one of the best I've read' Margaret Kaine Look out for Glenda's next compelling saga, The Tuppenny Child. Glenda Young credits her local library in the village of Ryhope, where she grew up, for giving her a love of books. She still lives close by in Sunderland and often gets her ideas for her stories on long bike rides along the coast. 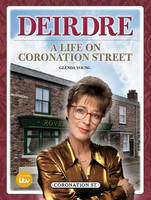 A life-long fan of Coronation Street, she runs two hugely popular fan websites. For updates on what Glenda is working on, visit her website glendayoungbooks.com and to find out more find her on Facebook/GlendaYoungAuthor and Twitter @flaming_nora.